The Libyan government announced Sunday that a US airstrike in the North African state had taken out the senior Algerian terrorist leader Mokhtar Belmokhtar, but on Thursday Belmokhtar's al-Mourabitoun terrorist organization denied the report. 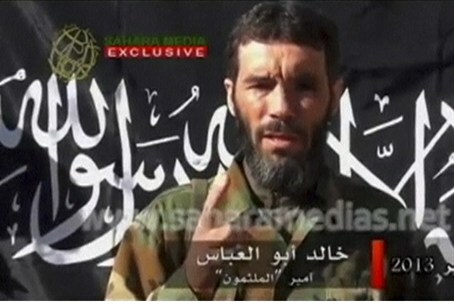 According to Al Arabiya on Friday, al-Mourabitoun, or The Sentinels, released a statement in Arabic via the Mauritanian news agency Alakhbar, denying that Belmokhtar was in the area of eastern Libya targeted in the strike. "We announce to our mujahideen brothers everywhere in the world that the news of the death of commander Khaled Abou El Abbas in an American air strike is false," said the statement, referring to Belmokhtar by ones of his aliases. Al Arabiya noted that the authenticity of the statement could not be immediately verified, while pointing out the Mauritanian news agency has been used by Islamist terror groups such as al-Mourabitoun in the past to release statements. The one-eyed Belmokhtar was formerly the head of Al Qaeda in the Islamic Maghreb (AQIM) before taking charge of al-Mourabitoun. After the Libyan government announced Belmokhtar's death, the Pentagon on Sunday night confirmed that Belmokhtar was targeted in the strike, but did not specify if he was killed. A Libyan military spokesman on Monday said it was too early to confirm if the terror leader had been taken out. French Defense Minister Jean-Yves Le Drian on Thursday said it was "very probable" Belmokhtar was killed but said he could not be sure, according to AFP. Speaking to the French BFMTV, Le Drian said, "we are not sure about it. There was a strike by the US army which targeted a place where he was supposed to be. But I cannot confirm his death. It's very probable, but it's still not certain." Belmokhtar is accused of masterminding an Algerian gas field attack in the Algerian Sahara in which he held hundreds of staff hostage, and likewise for running smuggling routes across North Africa. He has proven slippery, as there were reports in 2013 that he had been killed in a military assault in Mali.